Cytokeratin 8 (CK8) belongs to the type II (or B or basic) subfamily of high molecular weight cytokeratins and exists in combination with cytokeratin 18 (CK18). Cytokeratin 8 (CK8) belongs to the type II (or B or basic) subfamily of high molecular weight cytokeratins and exists in combination with cytokeratin 18 (CK18). This MAb cocktail recognizes all simple epithelia including glandular epithelium, for example thyroid, female breast, gastrointestinal tract, respiratory tract, and urogenital tract including transitional epithelium. All adenocarcinomas and most squamous carcinomas are positive but keratinizing squamous carcinomas are usually negative. 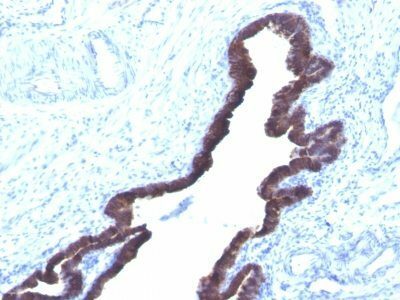 This antibody is useful in demonstrating the presence of Paget cells; there is very little keratin 18 in the normal epidermis so only Paget cells are stained.Immunohistochemical staining with this MAb is indistinguishable from that obtained with monoclonal antibody 5D3. 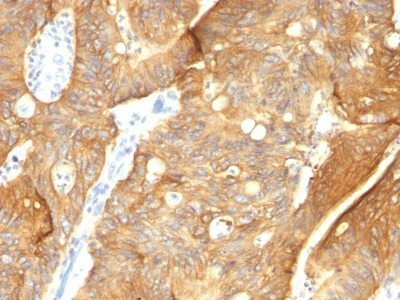 Catalog number key for antibody number 0691, Anti-Cytokeratin 8 (K8.8 DC10) The prefix indicates conjugation, followed by the antibody number and size suffix.